Around the Spiral with Edward Lifegem: Edward the Vampire OR Edward the Pirate? Edward the Vampire OR Edward the Pirate? I'm sorry I haven't made a Swashbuckler post in awhile. I have been busy in real life and haven't really been able to blog. I'm back now and ready to blog. Before I begin with today's quest I would like to remind you on what happened the last time I quest on my swashbuckler, Edward Cringle. On my last blog post I had to defeat Three Scars for Brother Wolf's one last quest he wanted me to complete. The first thing I had to do before defeating Three Scars was sinking Black Storm Raider ships. That wasn't difficult at all, I ended up having help from another pirate! After I was done sinking the ships I had to sail to a vortex to defeat Three Scars, hopefully once and forever. I didn't have much trouble defeating him since I hired a minion from the crowns shop. Sometimes you have to hire minions from the crowns shop, they are so helpful (since you get to command the minions what attacks to attack with and all) and don't even cost that much crowns! After I was done defeating Three Scars, I had to sail back to Bison Village to tell Raven Eyes the good news. I ended up finally restoring peace to the spirit world! After all of the month's of work I finally completed that part of the quest.. Keep reading this post to see what will happen next! Raven Eyes was grateful that I completed all of the quests to restore peace not only to the Spirit World but for the Bison. Raven Eyes wasn't the only one pleased, Thunderbird was too! 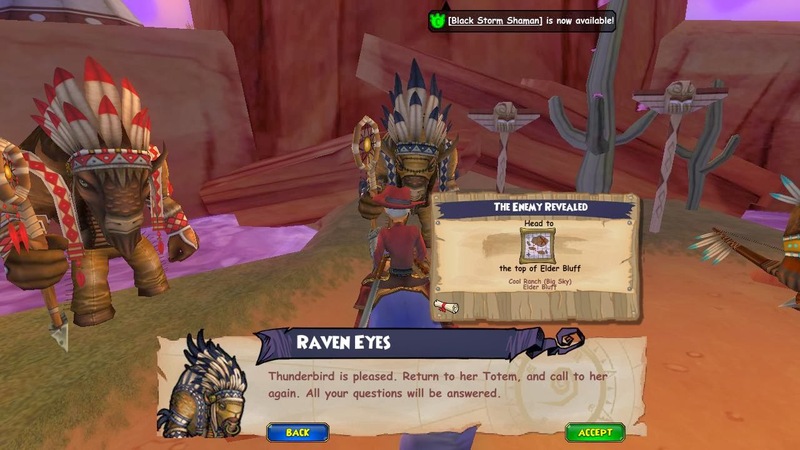 Raven Eyes told me that I needed to return to her totem and she'd end up answering all of my questions. I have one question.. I've been on this certain quest for awhile now and I don't really remember the main question. Is that bad?! Eh. She didn't really remind me when I talk to her but I guess I'll find out one of these days! Hey, I'm only a pirate, sometimes we pirates forget things (maybe I'm the only pirate that forgets). Wait.. no... I can't forget. I'm the strongest pirate on the game! You're a level 65 Swashbuckler? So what! I can sink your ship and I'm only kidding around right now. Here I am talking to myself again, well when I'm typing this it's like I'm talking to myself and I really need to stop before you question if I'm okay or not. Where was I? Oh yeah.. After I finished talking to Raven Eyes, I ended up talking to Thunderbird again! When I summoned Thunderbird she did answer a few of my questions, the I don't really remember but I'm sure I will once I'm done with this blog post questions. Thunderbird reminded me that I had to seek English Bill, an enemy of mine, but the only way I could harm English Bill is by finding silver bullets. Thunderbird also told me I can find English Bill on the Hill of Boots once I find the silver bullets. She told me I needed to find Silver first, well if I'm sure if I don't I'll just end up being defeated so it's time to find some silver! 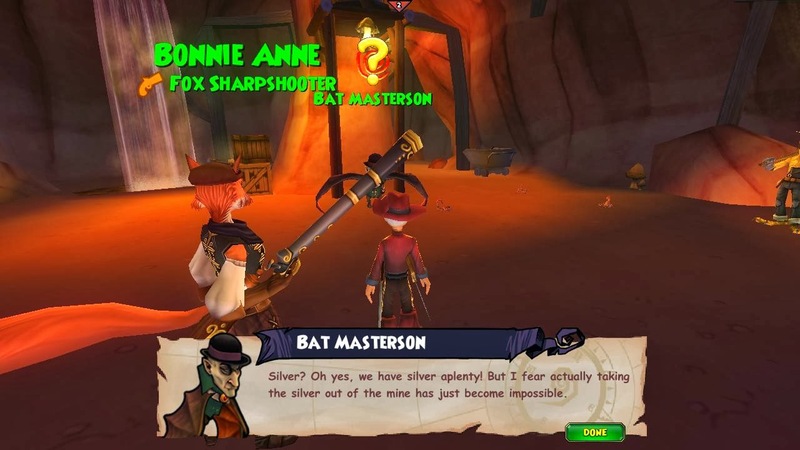 I had to talk to Silver Horn to see if he knew where I could find silver for the bullets and he told me that I can find silver in a Mine in Cooper's Roost. Now it's time to tell you why this post is named Edward the Vampire or Edward the Pirate?! Don't worry I'm not having neck pain, well I will if I'm bitten and I better not be bitten. I know my name is Edward but I WILL NOT be bitten by a vampire, I'm Edward the Pirate! Once I arrived to the Mine, I met up with a vampire bat, Bat Masterson. From there I have to end this post since I already made a long enough post today. I have to stop now but don't worry, I will have plenty more posts this month! Until then, read the dialog in the picture below and I'll see you next time. No... I'm not going to laugh about the dialog.. Edward the Vampire or Edward the Pirate? *grins* Then you're lucky Edward CULLEN hasn't gotten his hands on you (Or I should be worried as well... and be wary of any undead running near me). Should You Buy The Hoodoo Bundle? My Pet Finally Cast Fairy! It's time to sink Frogerale Ships!! 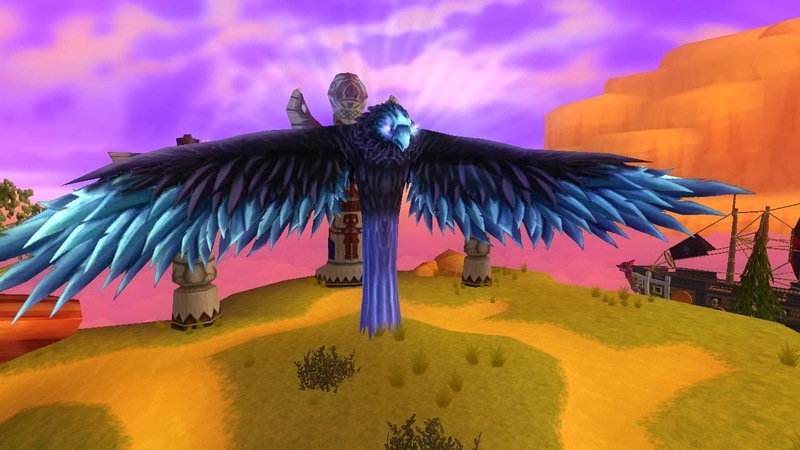 Darkmoor Ships, Angels and a Boss!